Prevents falls during the night. For children under 3, we recommand a portacrib rental. Need to rent a bed rail in Paris for more than 1 month? Contact us for a specific quote. 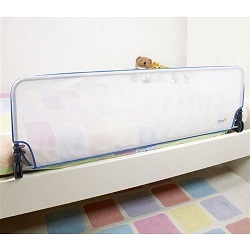 Very easy to use, this bed rail will allow you to have your toddler sleeping in a regular bed. Fully assembled, you just have to slide it under the mattress. It fits all types of beds (children beds longer than 1m56 or adult bed) and a large amplitude of mattress heights. This bed gate will allow safe nights to your child (and his parents!) wherever you're staying (rented flat, hotel, friends, relatives). It is delivered with instruction for use, to your address in Paris and anywhere in France. You were great. I really appreciated your willingness to work with me and the rental company to get me the items we needed. The baby gear was all in good shape and working order and everything was as described. I would highly recommend your service to others.